SOURCE: Disabled Veterans' LIFE Memorial Foundation, Inc.
WASHINGTON, DC--(Marketwired - Mar 18, 2014) - Following its most recent site visit to inspect construction progress, and in consultation with general contractor Turner Construction Company, the Board of Directors of the Disabled Veterans' LIFE Memorial Foundation is pleased to announce that it has selected October 5, 2014 as the date for the dedication ceremony of the much-anticipated American Veterans Disabled for Life Memorial in Washington, D.C.
President Barack Obama and Secretary of Veterans Affairs Eric Shinseki have been invited to speak at this historic occasion, more than 15 years in the making. Actor Gary Sinise, National Spokesman of The American Veterans Disabled for Life Memorial, has confirmed his participation in the dedication ceremony. "We are honored and thrilled to make this announcement today," said Foundation President Arthur H. Wilson. "It's been a long journey, but well worth the wait. At last we are in the home stretch of building a memorial to honor the countless veterans who became disabled in service to our country." 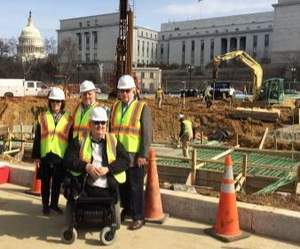 Unlike other national memorials, The American Veterans Disabled for Life Memorial will pay tribute to disabled veterans both living and deceased across all conflicts throughout the nation's history. The design of the Memorial, by the acclaimed firm Michael Vergason Landscape Architects, envisions a hallowed place amid the bustle of the surrounding Washington streets. Vergason's design was meant expressly for its audience -- disabled veterans, their loved ones, friends and caretakers -- who will now have a place for commemoration and quiet reflection. Through the juxtaposition of granite and glass, the design of the Memorial will convey the interplay of strength and vulnerability, loss and renewal. The focal point will be a star-shaped fountain, its surface broken only by a ceremonial flame. Water flows over the fountain's perimeter into a large triangular reflecting pool that mirrors the ever-changing sky, time of day and cycle of the seasons. Three walls of laminated glass panels with embedded text and photographs, and four bronze sculptures by noted sculptor Larry Kirkland, display the universal story of disabled veterans' pride of service, trauma of injury, challenge of healing and renewal of purpose. The Memorial was unanimously authorized by Congress in 2000, and signed into law on October 24, 2000 by President Clinton. The 2.4-acre triangular site, located between Washington Avenue SW, C Street SW and Second Street SW, behind the U.S. Botanic Garden and within view of the U.S. Capitol, was approved in 2001. The final design was approved in 2009 and 2010 by the U.S. Commission of Fine Arts and the National Capital Planning Commission respectively. In addition to the dedication date, the Board of Directors also announced that the Renaissance Washington, D.C. Downtown Hotel by Marriott will serve as the host hotel for the dedication event, with a special rate of $99 per night. The hotel is located at 999 Ninth Street, NW, Washington, D.C. For the special dedication rate, contact the hotel at 202-898-9000 and mention "American Veterans Disabled For Life Memorial Room Block" or click https://resweb.passkey.com/go/AVDLM14 to make a reservation online. Major contributors to the Memorial include the Disabled American Veterans (DAV); Lois Pope; H. Ross Perot, Sr.; AT&T; Ford Motor Fund; Fifth Third Foundation; TriWest Healthcare Alliance; Gary Sinise Foundation; Kirkland & Ellis, LLP; Peter G. Peterson; Health Net Federal Services; numerous other Veterans Service Organizations including Veterans of Foreign Wars of the U.S., Military Order of the Purple Heart, AMVETS; and more than one million individual donors. The Memorial is located at 150 Washington Ave., SW, Washington, D.C. For more information about The American Veterans Disabled for Life Memorial, visit www.avdlm.org. The Dedication Ceremony is free and open to the public. For tickets to the dedication, visit www.avdlm.org/dedication. Editor's Note: Images of the Memorial model are available by contacting The Murry Agency at (305) 531-5720. The mission of the Disabled Veterans' LIFE Memorial Foundation is to build The American Veterans Disabled for Life Memorial as a symbol of honor and unity for disabled veterans from all service branches and across all conflicts and generations. The Memorial, located in Washington D.C., will serve to educate, inform and remind all Americans of the human cost of war, and the sacrifices our disabled veterans, their families, and caregivers, have made on behalf of American freedom. Congress approved the Memorial and President Bill Clinton signed the federal legislation into law in October 2000. The law authorized the Disabled Veterans' LIFE Memorial Foundation to establish a Memorial to be dedicated to both living and deceased disabled veterans, and to raise all the funds necessary for construction, maintenance and preservation. Following an invitational design competition in 2003, the Foundation selected Michael Vergason Landscape Architects, Ltd., of Alexandria, Virginia, to design the Memorial, with the graphics, text and bronze components of the Memorial created by artist Larry Kirkland in collaboration with Cloud Gehshan Associates. Washington D.C.-based architectural firm Shalom Baranes Associates is the project architect. About this company Disabled Veterans' LIFE Memorial Foundation, Inc.
DVLMF Board members visit the site of The American Veterans Disabled for Life Memorial. Back row left to right: Diane Musselmann, Roberto Barrera, Art Wilson. Front row: Dennis Joyner. Not pictured: Lois Pope, Gene Murphy, Allen Kent.